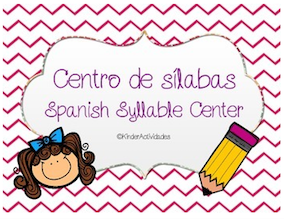 It's time to teach Spanish syllables! I have found it best to teach the syllables separately before combining the different vowel sounds. This centers packet allows students to practice and become comfortable reading syllables and words with the vowel "a" before moving onto the next vowel. Students read and match words with pictures. On the back of each page, they are able to break apart the same words in syllables and create some of their own words (real or silly...as long as they can read them back to me correctly!). Below is an example of the syllables with "e" page. There is a similar worksheet for each of the other 4 vowels. 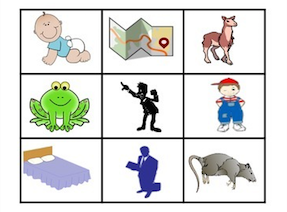 This product also includes a set of all of the clipart used on the worksheets. These can be used to practice vocabulary, reading, or spelling. You can print them and write the words on the back, or make separate index cards with these words on them to create a matching game. Get this Syllable Center HERE! 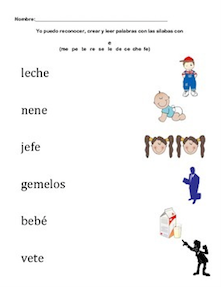 Visit my site for more Spanish syllable resources!